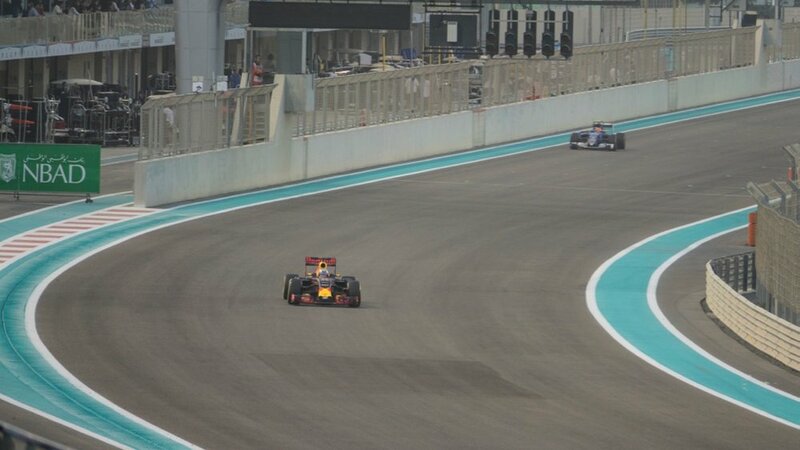 Friday was our first full day at the Abu Dhabi Grand Prix! Friday is a practice day for the drivers, which gave us about 3 hours of time at the track watching the action. 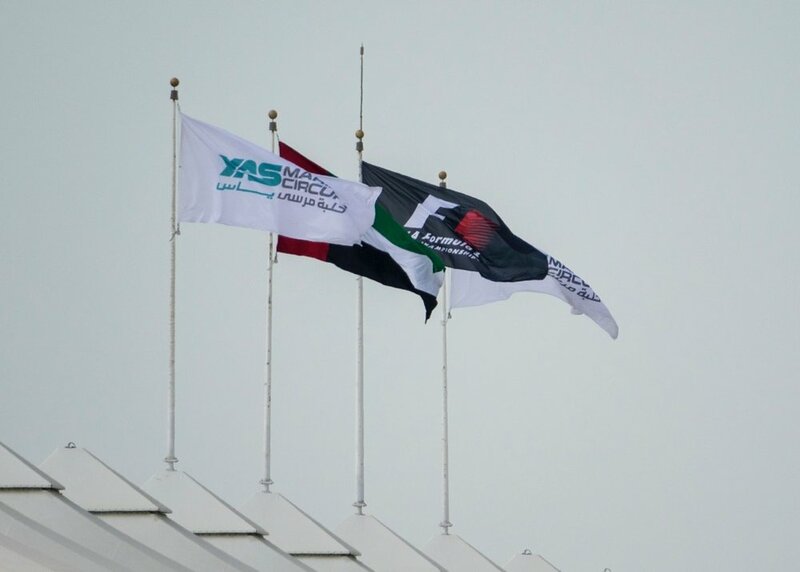 The first session was in the early afternoon, and the second at the same time the race will start on Sunday. 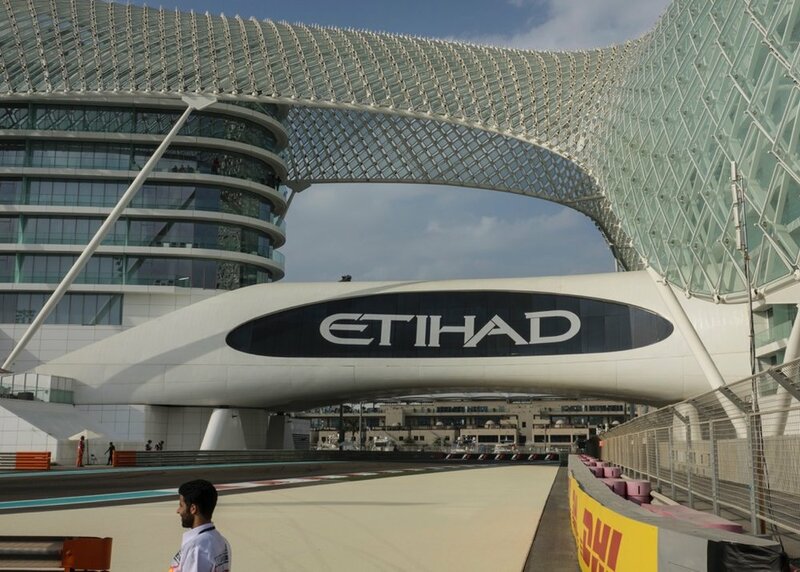 We also managed to walk around a lot of the track, and checked out the Yas Marina and the crazy Yas Viceroy Abu Dhabi Hotel. Friday morning we got up at a reasonable hour, and headed down to the beach. It's not the nicest beach I've ever seen, but the sand was beautiful, and the water was reasonably warm. Colder than we expected, but nice and refreshing. We swam for a bit (and had the beach to ourselves), before heading back to the room to get ready to head out to the race! One of the most surprising things we've found in the UAE is the proliferation of Tim Horton's. They're everywhere in Dubai and Abu Dhabi, and there's one a couple of blocks from our hotel. So we headed over there to have breakfast. It's pretty funny - they're almost exactly the same as one in Canada - a few different menu choices, but otherwise what you'd expect. 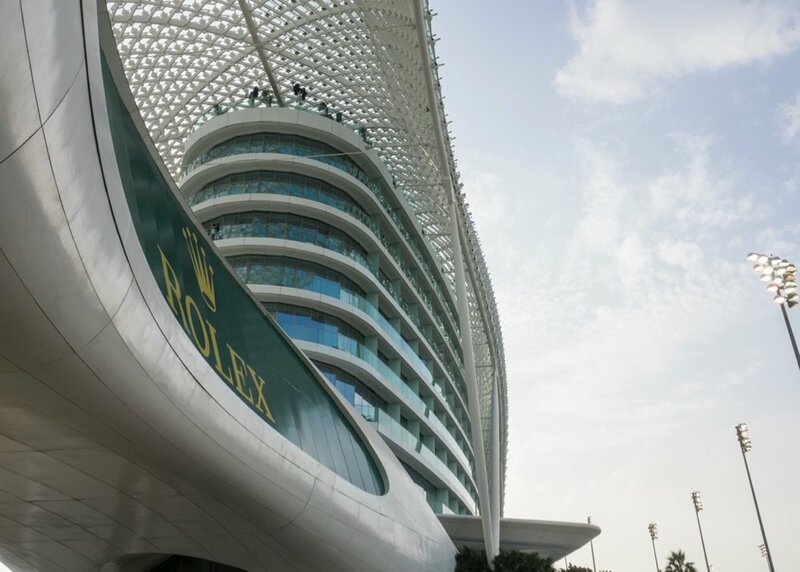 It has a great view of the Marina and the Yas Viceroy Hotel, so it should give great views come night when all the lights come on. Part one - the shade - checked out. It was nice and cool, and out of the sun which was amazing. We were just in time for the first practice session, and it was amazing. So much noise! The cars come flying down the straight to our left, then brake hard into the chicane, before making a hard turn and accelerating off on the other side of the track. Hopefully we'll see some overtaking into that turn on race day. A layout of the track at the Abu Dhabi Grand Prix. This was also a chance to test out the camera and see how it works. Overall it's pretty good, but I think I'm going to regret not having my SLR for this. As good as this camera has been (and it will be great for travel), it's not really up to the high speeds of capture Formula 1 cars. We'll see what it's like once we get home and I process the pics. The view straight ahead from our seats, looking at the chicane on the turn headinf back to the marina. Looking to our left, you see the cars as the come along the straight, through the DRS zone. 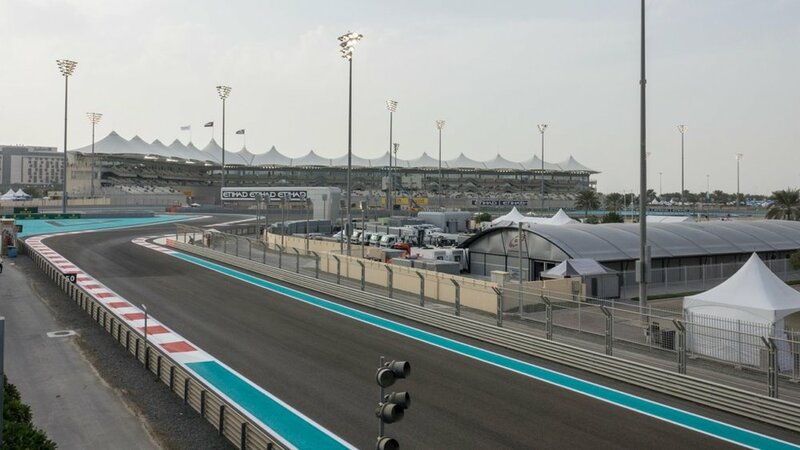 Looking out across the track and the marina, to the Yas Viceroy Hotel. You could see Ferrari World, out in the distance. A bit of a panorama of the track. Looking out at some of the crazy boats in the marina. After watching the practice session, we went down and checked out the South Oasis. This was pretty much the same as the one we had been in on Thursday - lots of food choices, a bar, live music and things going on. We wandered around, and checked things our for a bit, and had a beer at the bar. Looking down on the South Oasis from the grandstand. Some of the fun lounge areas in the Oasis. They provided some fun areas to watch the race activities, from within the Oasis. The GP2 practice session was about to start (GP2 is the feeder series for Formula 1), but rather than watch from our seats we decided to walk around to the Marina to check that area out. So we headed out from the race and walked around the south end of the track over to the Marina. The South Grandstand, as seen from the entrance to the Yas Marina. 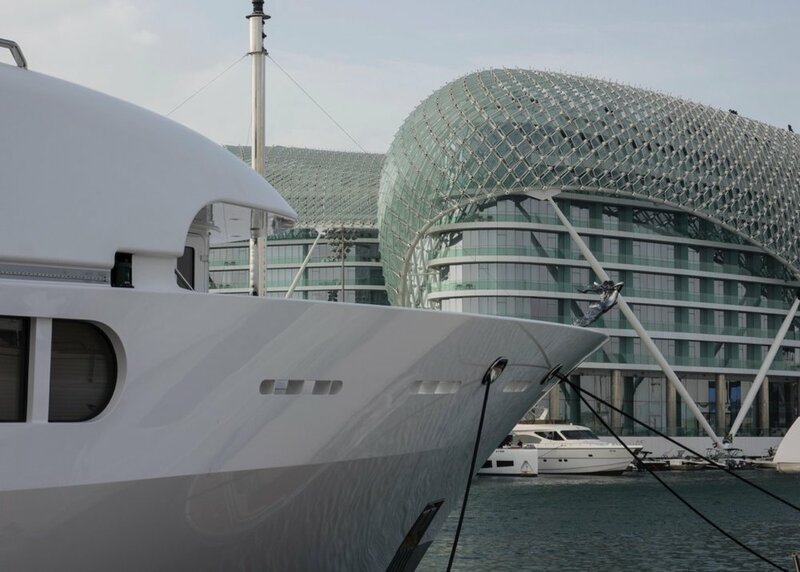 If you've ever watched the race, you'll have seen these amazing super yachts berthed in the marina near the Yas Viceroy Abu Dhabi Hotel, overlooking the race track. It's an amazing place, with cool restaurants, bars and clubs and an amazing assortment of crazy yachts. The other pretty wild thing was the "Platinum Parking" lot, filled with Rolls Royces, Bentleys, Ferraris, and other super cars. There was even a Porsche 918, which you don't see a lot of (although we did see 3 today...). ONe of the cool bars in the Marina. A Porsche 918 Hybrid in the Platinum parking lot. Lot's of crazy expensive and beautiful cars. After checking out the marina, we walked along a path that parallels the race course. As the practice session was still going on, we were 30-40 feet away from race cars screaming by at 200+ km and hour. The noise was incredible, and it was cool to be that close. 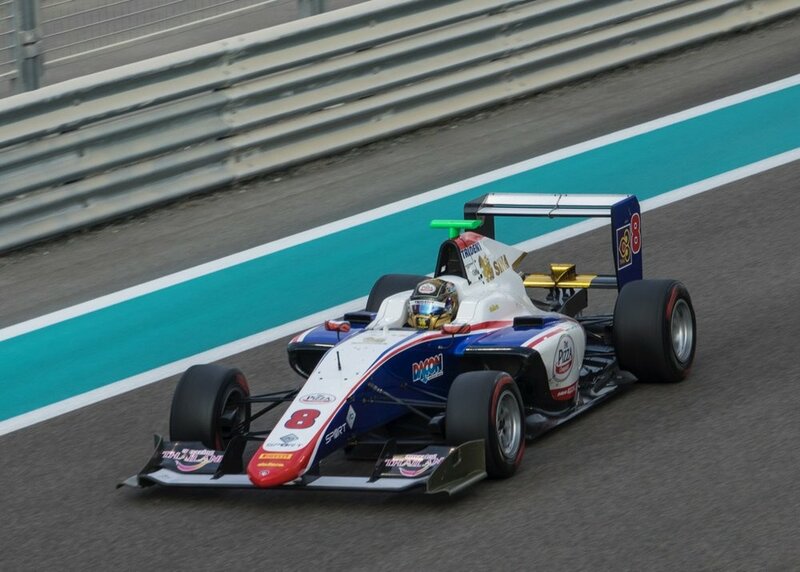 GP2 car flying by during practice. The gallery below has a series of images from the GP2 practice session from a number of places along the track. We wandered along the track, which gave us great views of the cars at different points in the race. It also took us under the bridge that is part of the Yas Viceroy, that the cars also pass under. We eventually were able to walk all the way up to the hotel, but it looked like you needed to be a guest to go inside. There were more amazing cars (including a Bugatti) out front of the hotel in the valet. A Bugatti Veyron - you just don't see that every day! From this angle, the Yas Viceroy Abu Dhabi Hotel looks almost like a ship in the marina. At that point we turned around and walked back along the race course, back to the marina. We picked one of the restaurants and had a crazy expensive late lunch. 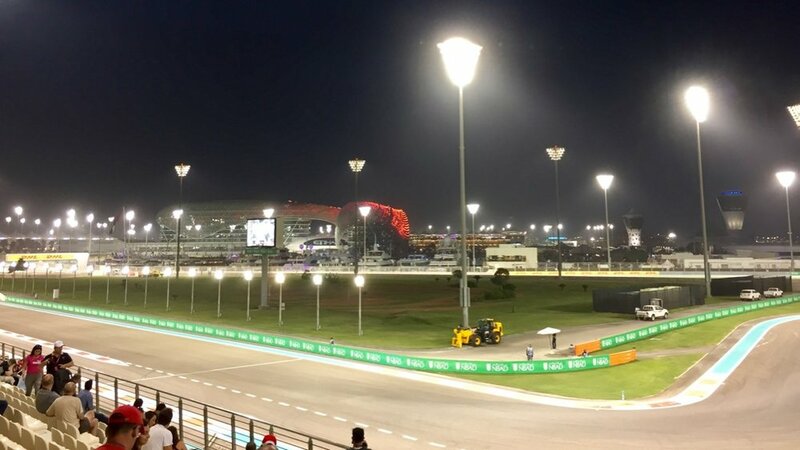 Once our meal was over, it was time to head back to the South Grandstand to watch the evening practice session. This was Justine's favourite crazy ship in the marina. I love the swimming pool on the bottom deck. The biggest ship in the marina was rented by Hublot, the luxury watch maker. You too can rent the Titania, if you have a cool 500,000 Euros a week! The session was another hour and a half. 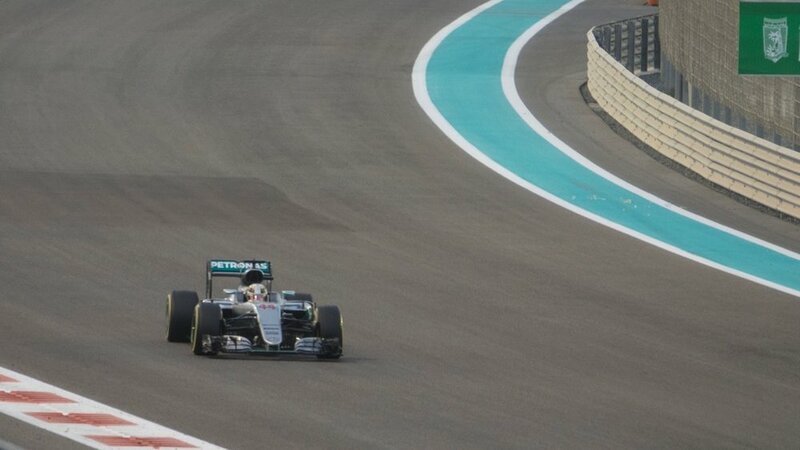 For the drivers, it was a practice session that replicated the time of day (and temperatures) of the real race. For me, it was a chance to try my camera in more challenging lighting. Sadly, it didn't hold up well - once the sun went down, there wasn't a lot of light and the pics weren't that great. Getting started with Practice 2 with one of the Williams cars. The lights were just starting to come on on the Yas Viceroy Abu Dhabi Hotel. 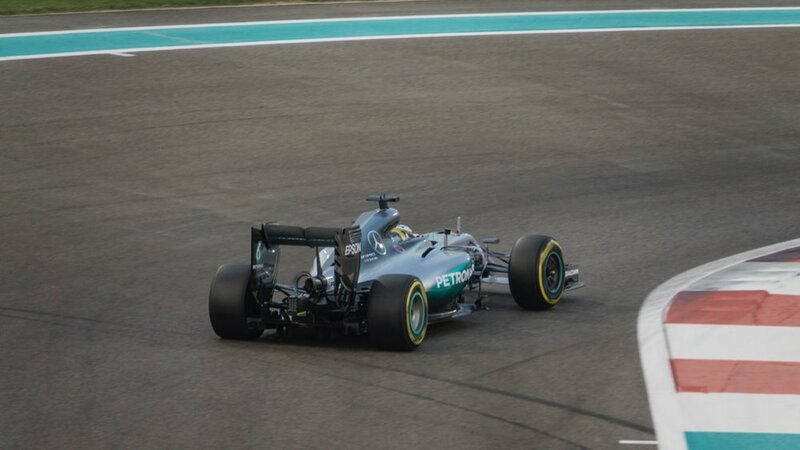 Lewis Hamilton in the Mercedes. 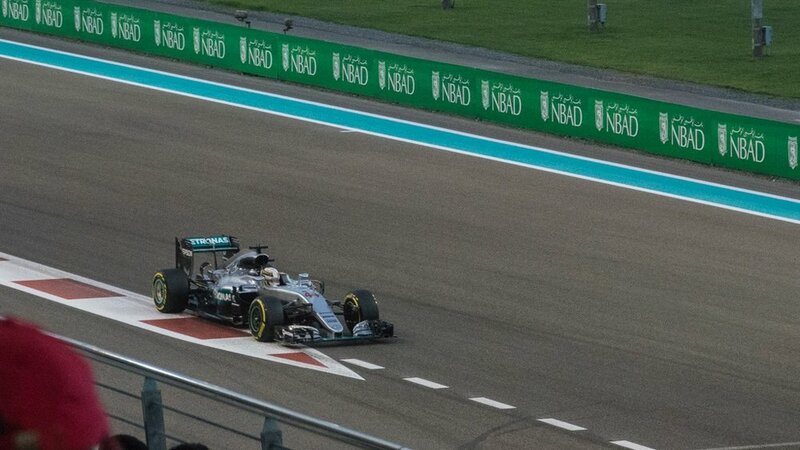 Lewis Hamilton flying along the course. 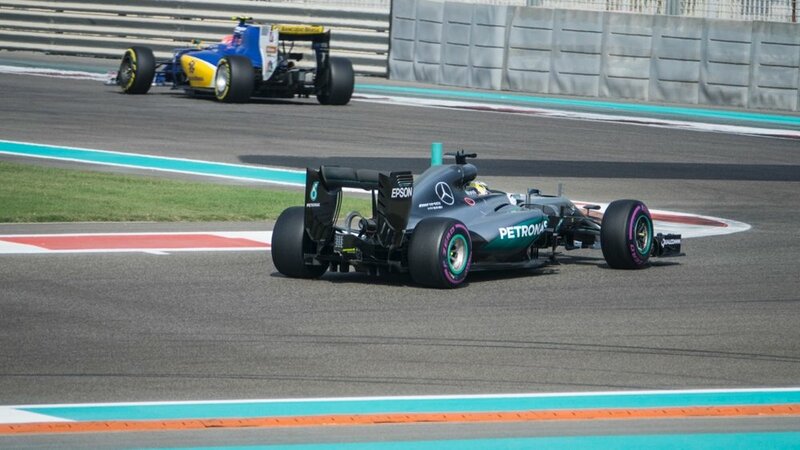 A closer shot of the Mercedes. Night was starting to descend and we got our first real feel for the track at night. Felipe Massa in the #19 Williams car. 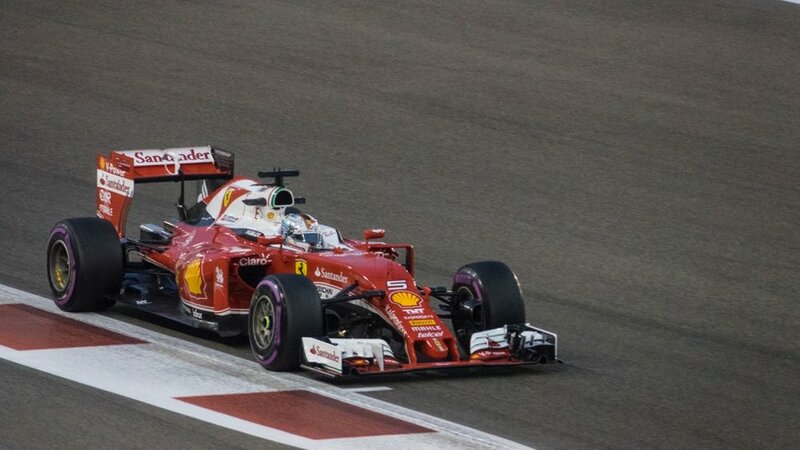 Sebastian Vettel in the #5 Ferrari. 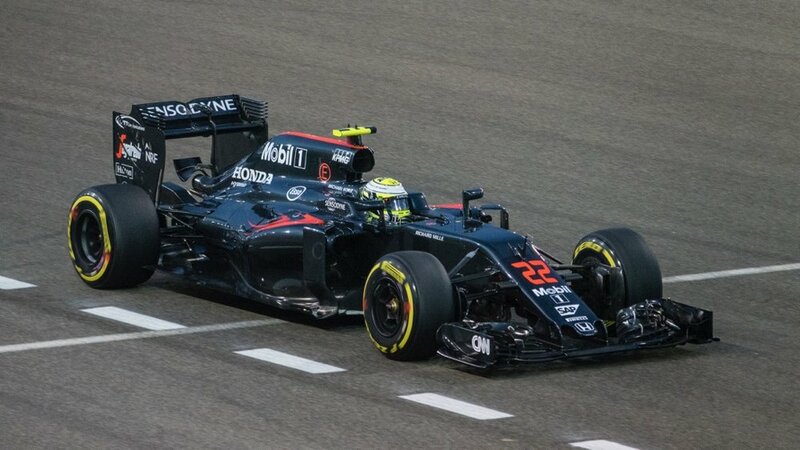 Jenson Button, driving for McLaren Honda. It was his last race before retiring from Formula 1. 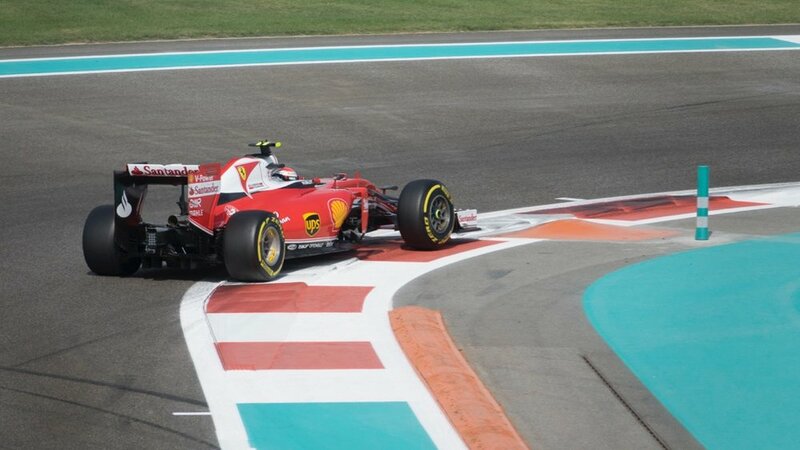 Kimi Räikkönen, in the #7 Ferrari. 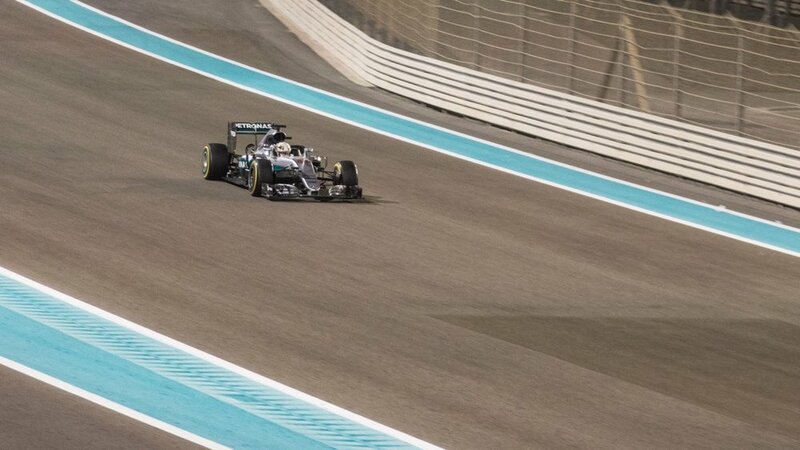 Nico Rosberg, the other Mercedes driver. As the sun set, the lights came up. Afterwards we went back down to the Oasis. I bought myself a Mercedes team hat, and we had a drink in the bar. It was packed, and everyone was having a good time. The music was loud, but completely drowned out once the GP2 qualifying session started up. We went back up to our seats and watched for a bit, before heading out. Hanging out at the South Oasis after the practice session was complete. One of the attractions that are part of the race experience is a series of concerts that they hold in the evenings at the Du Arena that seems to be part of the Ferrari World structure. There are four concerts, one each evening. Thursday night was Pitbull (which we skipped), but tonight was the Chemical Brothers, so we decide to head over to check it out. Saturday night was Lionel Richie, and Sunday closes with Rihanna - we'll see what these are like. The Chemical Brothers put on a great show, with an amazing light display. The arena itself is a massive, open air venue - no idea how many people it holds but it is a lot! We ended up over there around 8 p.m., and got through relatively easily. There was an opening act named Arcade 82 (which was awful), and then the show got started around 9:30. We stayed for a while - the music wasn't my favourite, but the light show was amazing. Rather than wait for the rush of people at the end of the show, we lefty early and got a taxi at Ferrari World back to our hotel. It was a very long day, but an amazing one.